Thank you Amy Kitchener of the Alliance for California Traditional Arts ACTA in Fresno, an organization she co-founded in 1997, for inviting me to lunch last Tuesday (May 24th) with Rocco Landesman, Chairman of the NEA on his first visit to the Central Valley. The purpose of the lunch meeting, that included twenty or so local traditional artists, was Creative Placemaking, approaches through cultural activities to enhance the character and identity of neighborhoods, cities and regions. In my little canyon most of the time, I was once again surprised to see that the San Joaquin Valley is indeed a melting pot of many cultures. The NEA’s new slogan ‘ART WORKS’ seems an ambitious and sensible approach to enriching all our lives. Coincidently, I was questioned recently about NEA’s ‘subsidy’ of cowboy poetry, all stemming from the unsubstantiated comments on the Rush Limbaugh radio show last month. I continue to be dismayed that despite the facts, people believe what they want to believe – like gathering acorns, looking to fill their empty baskets. We’ve begun weaning calves, a plaintive chorus at the corrals in Greasy and along Dry Creek, as mothers check-in and locate their babies between grazing. The older cows know the routine, some looking forward to the process. The calves average 600 lbs. or more, no longer dependent on mother’s milk. The separation is mostly emotional, a fence between them for the first time in seven months, but the calves quickly adapt to good alfalfa hay, stay full and quit bawling in a couple of days. The cool weather has been ideal, as we work to control dust in the corrals that can create eye problems and even pneumonia. Our process lasts seven days before we turn the calves out on the irrigated pasture, supplemented with more hay that has skyrocketed this year to over $300/ton. We’ve also been gathering last year’s heifer calves that were exposed to the Wagyu bulls during the winter months, to make room for the cows we just weaned, to make room for this year’s weaned heifer calves to be bred to the Wagyu. We’ll drive the first-calf heifers up the creek and split the bunch between two pastures around the house so that we can keep an eye on them as they calve this fall – our harvest and preparation for the next crop. A busy time of year as we also cull some of the older cows that may have difficulty supporting a calf at the colder and higher elevations of the ranch, inserting some of the younger cows in their places, keeping our pastures stocked. We have a plan that can get confusing, at times, as we try to adapt to feed and weather conditions, as well as changing market demands and opportunities – trying to stay flexible and ever aware of our slow cash flow before our annual payday. Long advocates of small family farms and cattle operations, we see the efficiency of seeing all our cows in the corral this time of year, not having to depend on second-hand assessments and descriptions as we prepare for the next calf crop. Then also, there is the special satisfaction we enjoy as we collect our steer calves that will be sold and shipped around mid-July, guessing what they’ll weigh against their weaning weights. Because we can’t wean them all at once due to the configuration of the ranch, we will be busy for next two or three weeks, so posts may be sporadic. Thankfully the temperature has been cool, making it easier on us all. Twenty five years ago, Tulare County issued a Conditional Use Permit to mine rock and gravel here – in 1985, or thereabouts. 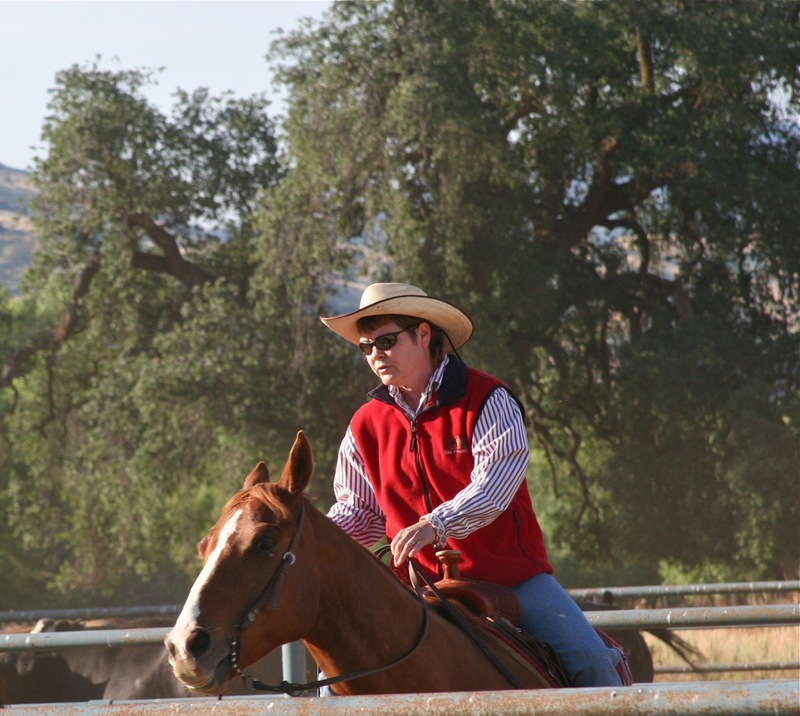 It was controversial, but it also brought a community together to insist that the operators comply, and that Tulare County enforce, the conditions of that permit. 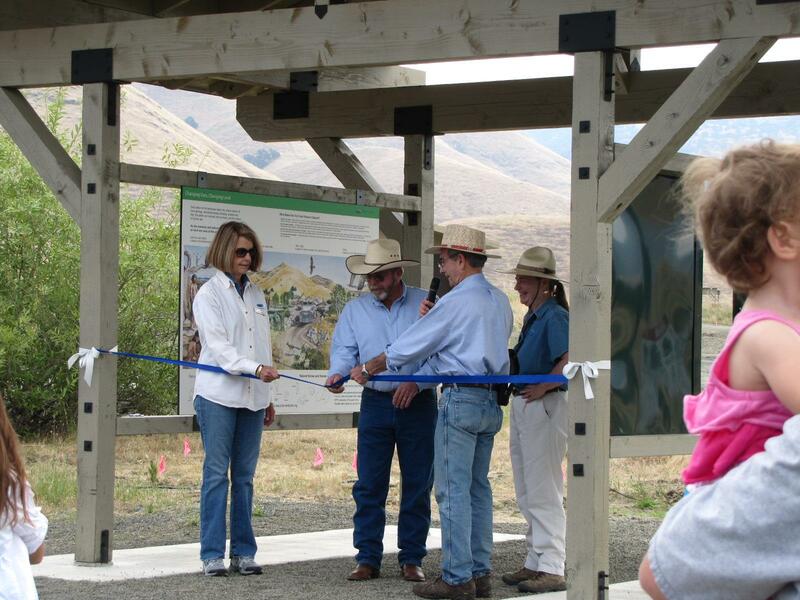 I am honored to cut this ribbon on their behalf, on the behalf of my mother and father who understood the forces at work from the beginning – on behalf of this community of families on Dry Creek who were forced to adapt to the drastic changes that rock and gravel mining brought here, and for the many with vision outside this canyon who supported us, offered us hope, direction and their expertise. We welcome this new beginning. All went well to the scales, Jody’s weighed about 8:30 a.m., ours about 7:30 a.m. We knew we would have to wait on the brand inspector, expecting him about 9:30 a.m., busy inspecting 4 loads, ½ mile up the road, after inspecting 6 loads, ten miles from here. 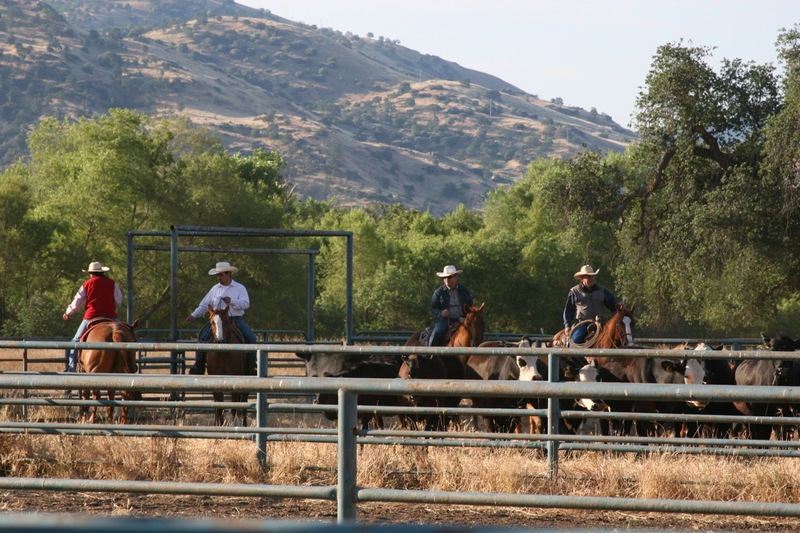 We, of course, never heard from the truck driver who had only second-hand directions, and who sailed right on up the road to stop alongside my neighbor’s patchwork corrals as they were bringing- in 200 1000# Mexican steers. The brand inspector, who was hiding behind the chute, sent him on up to our other corrals, where we are weaning calves, to get him gone. Seeing no one there, he went on. Once done, the brand inspector went up the road, seeing no one there, turned around went back to where he started this a.m. to inspect 3 more loads. Meanwhile, another neighbor brings the truck driver to us in his little Toyota. Fortunately, the truck driver stopped where the road narrows and we could let him through a gate to get turned around. But while waiting for the brand inspector with us, the truck driver mentions his earlier encounter with the brand inspector by saying, ‘Maybe, I should have said something sooner…’, when we realize that the brand inspector mistakenly sent the truck driver in the wrong direction, then missing the open gate and trucked backed up to the chute, left the canyon. Truck loaded and gone @ 11:45 a.m.
slit-eyes watering in a light rain. of the high desert in May. to chase the cold river downstream. most to those who do for themselves. where almost Anyman can be a comedian. connect the Kaweahs, loaded with snow. with itself will never be the same. bent to a breeze before the storm. almost perfect if she were a wild thing. 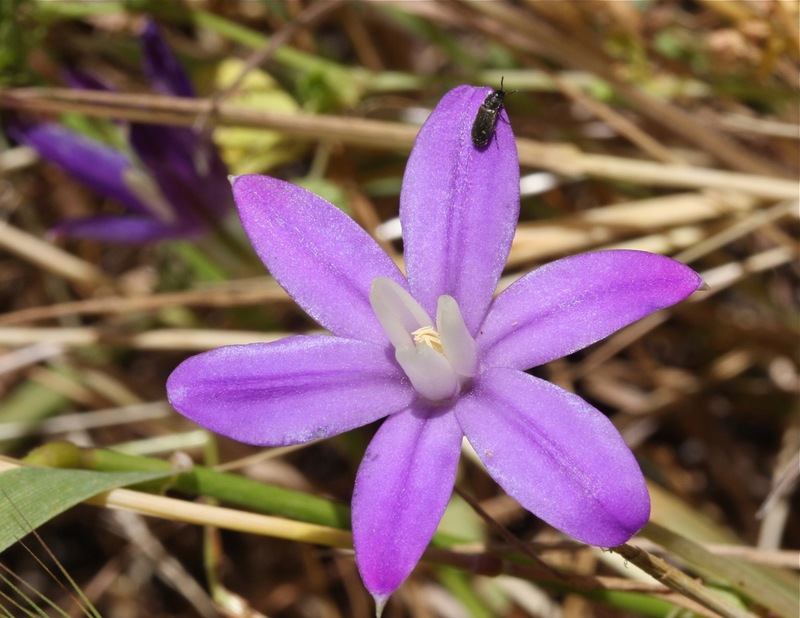 Prior to the mid-1980s, the Kaweah Brodiaea was thought to have been extinct. 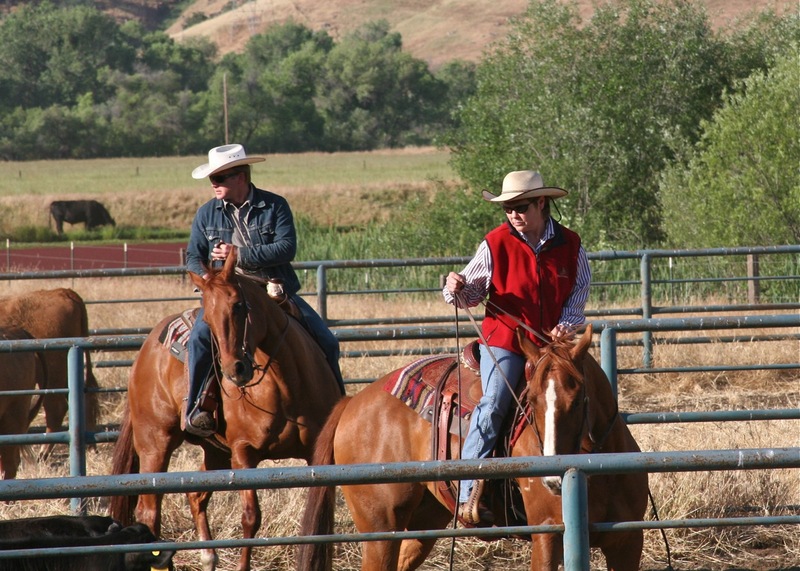 Larry Norris, who was conducting a Biological Assessment for the USACE surrounding the Lake Kaweah Enlargement Project, rediscovered it on the ranch. Thinking he was on USACE lands as first mapped during the initial construction phases of Terminus Dam in 1959, he contacted me to get easier access to the location so that he might assess the population of this rare wildflower, that he later determined to be 300,000 – 500,000 plants on ground we graze. 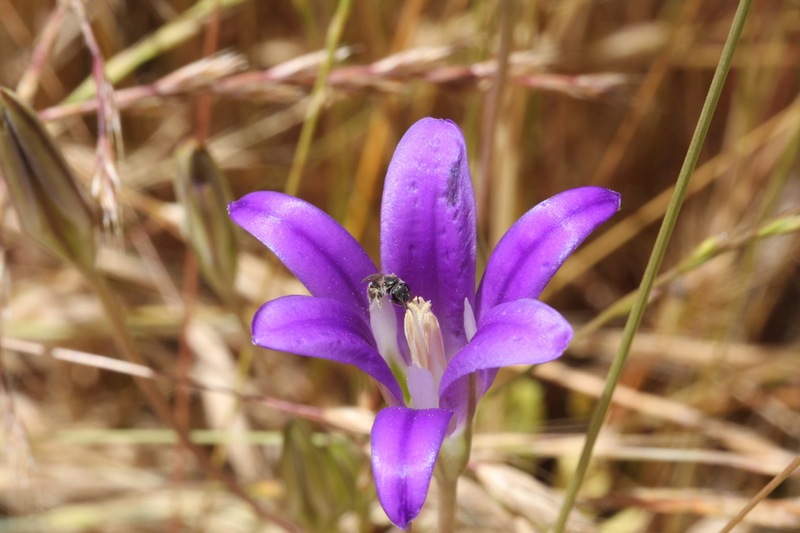 Kaweah Brodiaea is now an Endangered Species, and since has been identified in the Kaweah River drainage upstream from Lake Kaweah in the vicinity of Three Rivers. 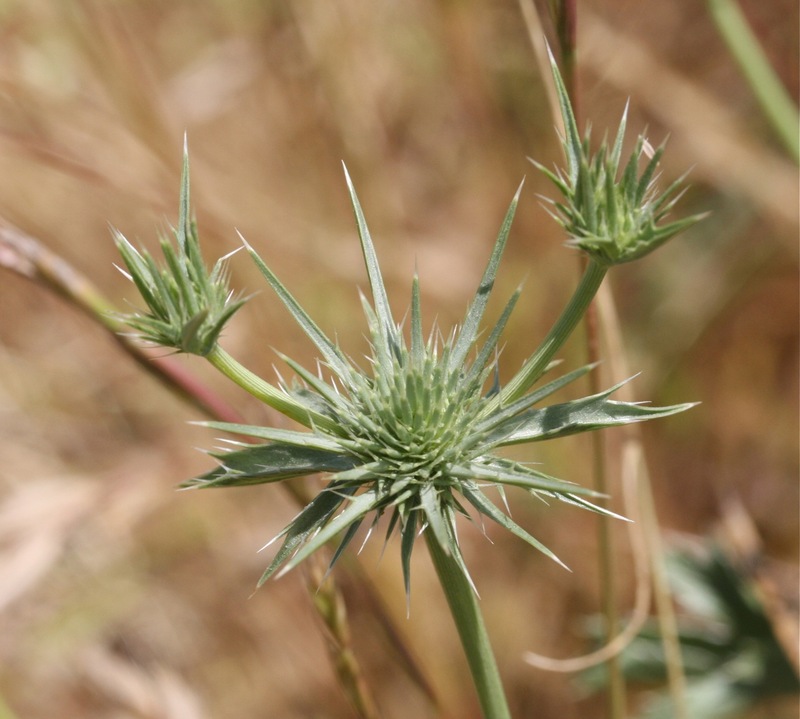 The wildflower has been cussed and discussed profusely as an obstacle to any kind of development in the area. The Brodiaeas are tough. 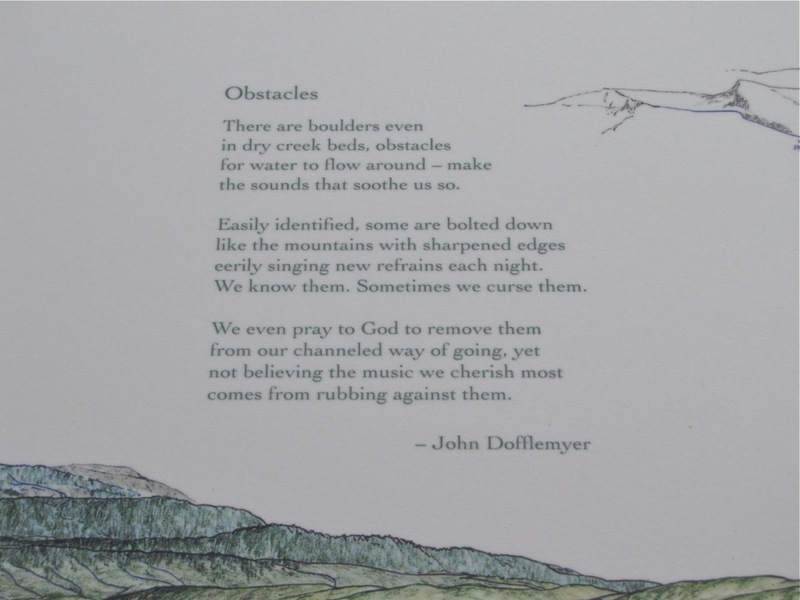 The largest population of Kaweah Brodiaea in the world is thought to exist within our 300-acre flat that has been grazed for 150 years – and from where the imagery for one of my first cowboy poems was drawn. 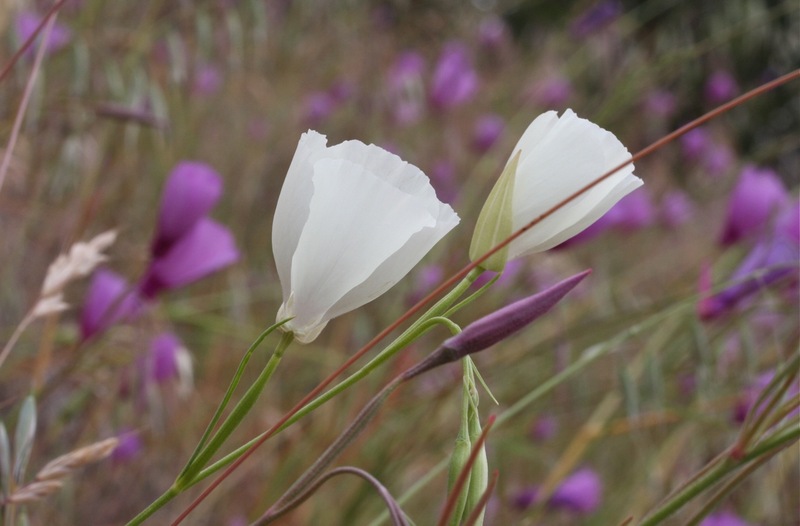 * May 16, 2011 – I revisited the Kaweah Brodiaea to discover that they are no longer in bloom. The Elegans are just getting started. With less than 10 days of bloom, no wonder I had so much difficulty finding them.